this time of year, when fruits and veggies are at their best i like to keep things simple. truly, this time of year it is best to let them be exactl who they are -fresh, flavorful, wonderful. for fathers's day, i invited my dad over for breakfast. my dad and i share a love of gardening and all things found in nature - i proudly say i inherited is green thumb and passion for backyard gardening. i knew my dad would enjoy this little addition to the breakfast table, especially the radishes. that man loves his radishes. growing up, i was always surrounded by fresh fruits and veggies straight fom our backyard garden. a little salt & pepper was all we ever needed to bring out the full flavor of just picked radishes, tomatoes and cukes. for my fruit ad veggie plate i went with local organic strawberries, patricia breakfast radishes from my garden and sliced watermelon. i am head over heels inlove with the colors - too pretty for words. 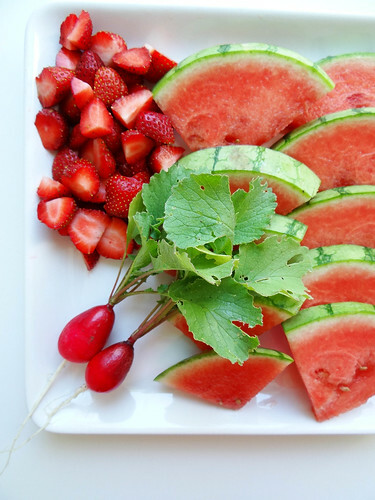 strawberries are hulled and quartered, watermelon sliced and radishes were thinly sliced and drizzled with excellent olive oil and sprinkled with flaky salt & freshly cracked pepper. perfection; and like i knew he would, my dad went straight for the radishes. this little array would be perfect for a summer happy hour in your garden with friends, brunch breakfast or a light lunch. perfect for anytime this summer that calls for a cool refreshing retreat from the heat. I like it simple also...! 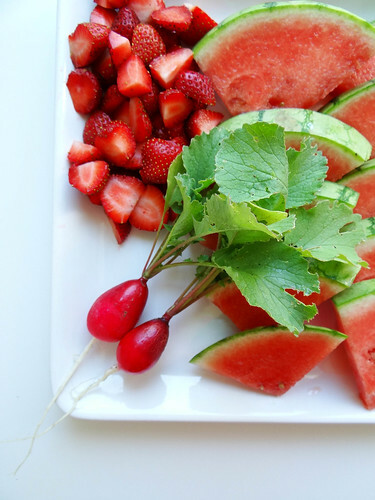 Fruits and veggies are so tasty in summer...I have some radish in my garden and they are ready !! I will make your roasted radish salad!...and probably this recipe also. 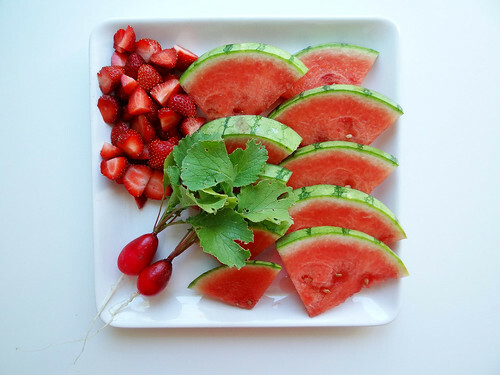 :) Beautiful pictures...simple and delicious looking. Thank you Lysa- this time of year is truly the best time to keep things simple and let the beauty of the fruits and veggies really shine! omigosh..after my hour-long run this morning and sweating far more than any woman should, this plate looks like absolutely heaven to me. i am lusting. truly. Definitely a refreshing treat after a long run - especially with the heat we had last week! This looks PERFECT! Perfect for summer, perfect for the hot weather... just perfect in general! Oh Heather, that plate is absolutely STUNNING!! oh my gosh - that color is gorgeous!! I'm head over heels for it too:) what a wonderful way to celebrate Father's Day. and what a great gift to have inherited from him:) Thanks for sharing! hope you have a fantastic weekend! I am so happy you made this a few days ago! 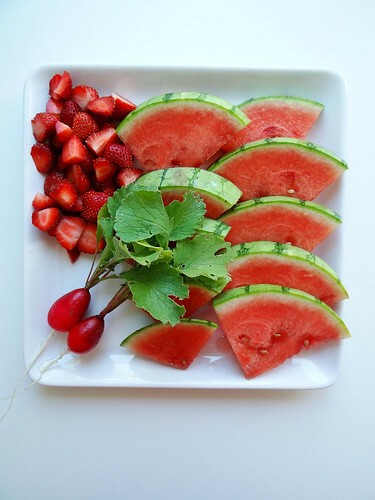 This is inspiring me to get some watermelon into my life asap! Looks delicious. Awe. It's so pretty and red. I wish my breakfasts looked this good. redddd.. i have 5 strawberries in t he garden now.. we ate 4 last week! its a small garden, so everything is in single digits.. but hey we grew it.. :) that is one lovely fresh plate! 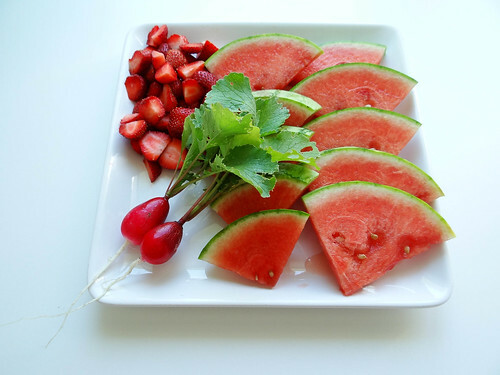 i need some juicy watermelon.. I love that you ate 4 out of 5 strawberries :) and I totally LOVE that you have a balcony garden, more people should follow your lead Richa! Look at those colors! Heather! What a great addition to a summer brunch, or any meal, really! Love it! Aren't the colors amazing! After I had plated it up Ihadn't intended to photo the finished plate but it was too pretty not too! Then this is the perfect plate for you! Thanks for being so wonderful! Perfect for all occasions my friend looking so beautiful and tasty! You are so right perfect for any occassion - I am thinking happy hour in the Garden!